The place I am showcasing today is ‘Urara,’ a garden café and bar located in Daikanyama. Their shaved ice is super popular in summer. It’s somewhere I love and often go to in my private time. It’s an old Japanese-style house so it has a much different atmosphere to that of stylish Daikanyama. The outside of it has a warm and welcoming feel to it that will have you wanting to see what kind of place it is. Upon entering through the shop sign curtain, you arrive in the courtyard which is surrounded by trees. You can hear the sounds of birds from somewhere, and when the wind blows you also hear the rustling of tree leaves. You completely forget you’re in Tokyo as you feel like you’ve come to a grandma’s house in the countryside. It’s very relaxing. Hm? What’s this odd looking thing? 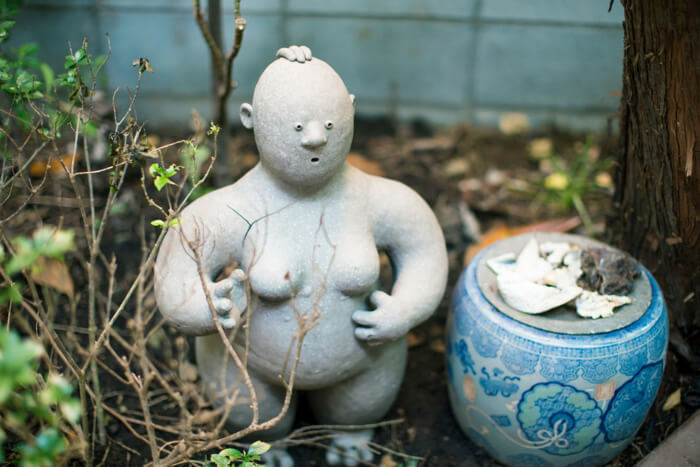 These unique ornaments were scattered all around the courtyard ready to greet us! This sign makes for a great photo spot. 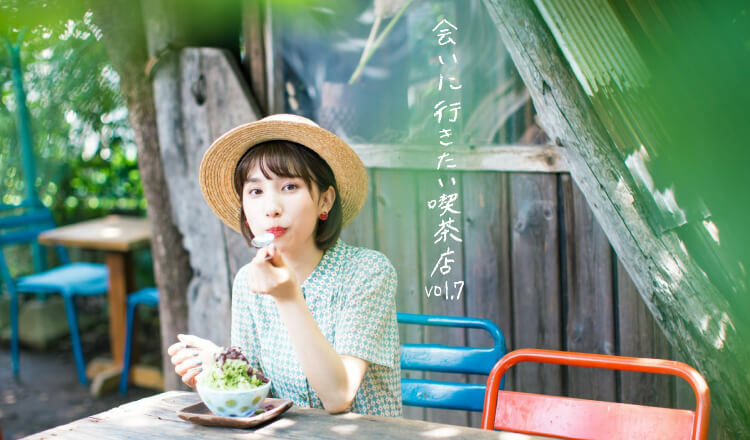 It says ‘Urara’ just like the name of the café. Its nostalgic design is so cute! When you really look, it says tissue paper on it! There’s lots to be discovered on the posters and signs that make up the interior, it’s a lot of fun! I ordered the Uji adzuki bean shaved ice topped with condensed milk! It cost ¥600 for the shaved ice and ¥100 for the topping. The matcha used is from Uji in Kyoto. 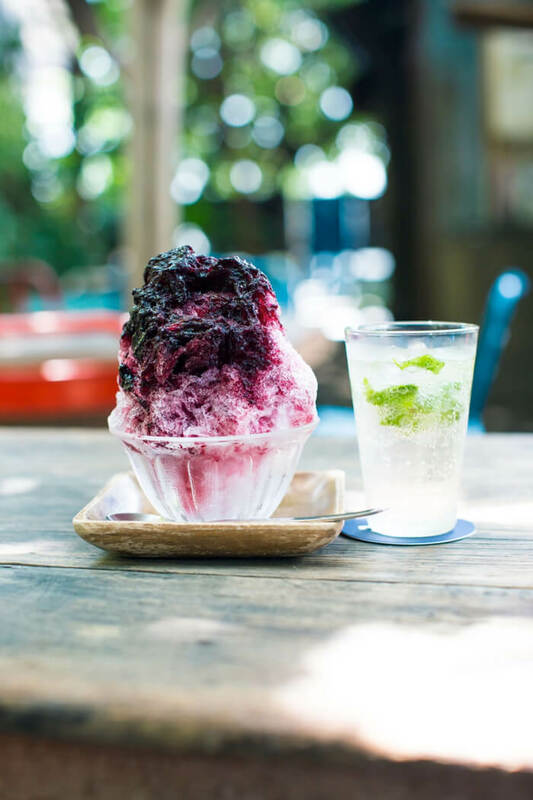 Such a big portion of shaved ice is enough to cool you down by just looking at it. 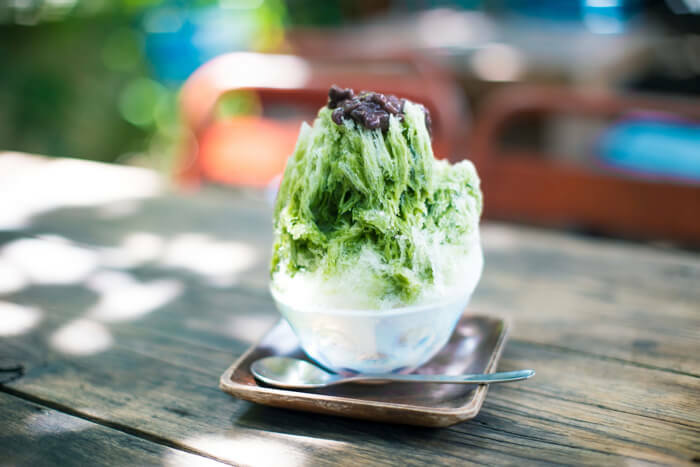 The matcha seeped all the way to the middle of the shaved ice. The refreshing sweetness was so tasty. The adzuki beans are from Tokachi in Hokkaido. They were a perfect combination with the condensed milk. The ice used is natural ice from Nikko. It’s fluffy, tastes great, and doesn’t give you brain freeze! Natural ice is different from regular ice. It’s frozen slowly so the crystals have high density, and it takes longer for it to melt. The cool part was how it didn’t crumple instantly when I poured the syrup on it! This is blueberry syrup (¥600). The blueberries used are from Nagano. They make it from jam in the café. Isn’t the colour just beautiful? It has that sour flavour that blueberries have and a refreshing, lip-smacking sweetness. I normally don’t drink alcohol, but since Urara is a café and a bar I will show you a mojito (¥600). The mint is so refreshing! On a hot summer’s day it seems like there are people who order both shaved ice and beer together. They’re seasonal items so will satisfy and cool you down. I also got to meet Tama-chan, the cat who comes to play at Urara. One time when I came before Tama was out walking so I didn’t get to meet him. Lastly, I snapped a photo with Arai who’s in charge of promoting Urara! We’re roughly the same height and have a similar interest in clothes so I grew an affinity with her. Coffee shops and cafés in old style Japanese houses tell you something about the people associated with them. 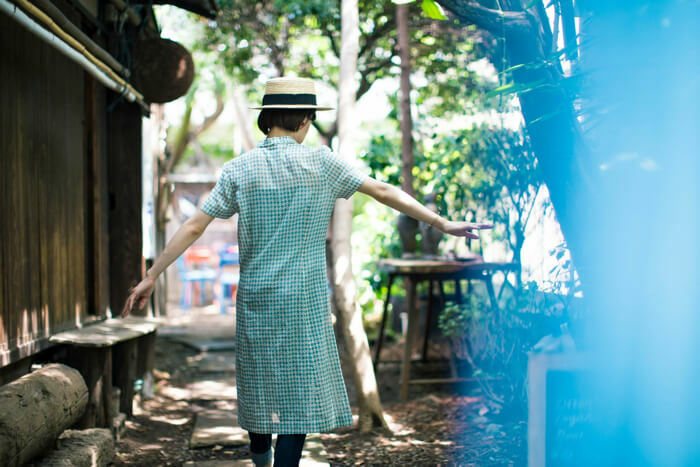 Urara feels natural thanks to SELIN & Co., an apparel maker who make things that feel one with nature. The staff at Urara all love living things, so the big hearted atmosphere there was really wonderful. I think I’d want to put out something warm like Urara. “Emaeri” is the nickname for models Ema and Eri Tanioku, who are Aomoji fashion model twins. Ema and Eri Tanioku specialise in twin fashion coordination. Over the years their fanbase has increased due to their cute looks. 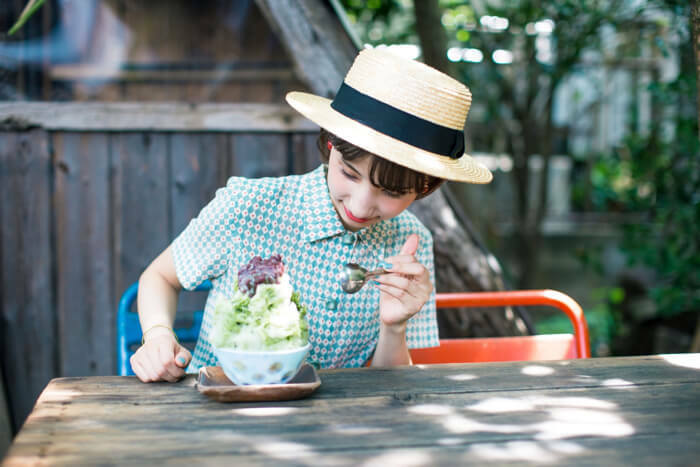 Ema Tanioku spreads Harajuku culture within Japan as well as overseas and works as a Harajuku Tourism Ambassador. Starting off as a model, Ema has broadened her talent range from fashion magazines to TV, and from playing the lead role in dramas to movies. 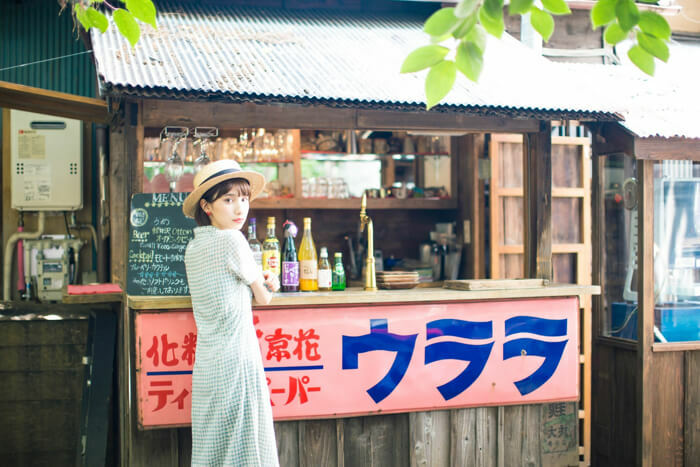 【Tokyo Stroll】An old café and beauty spots – Ema and Eri’s recommended day out in Harajuku! 【Tokyo Stroll】The cafe that you want to visit to see someone #1 The popular cafe in Jinbo-cho called “Sabouru” that has retro interior and nostalgic food.